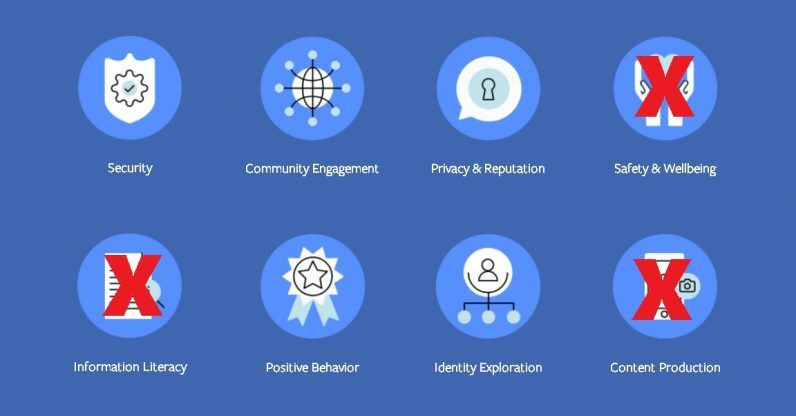 Facebook today released a “Digital Literacy Library,” a series of education modules designed to help parents and teachers educate children on best behavior online. But Facebook seems to be leaving out questions about what it could do to protect kids online as well. The lessons, aimed at children between the ages of 11-18, cover such topics as privacy, security, and how to behave respectfully. The lessons were created by Harvard’s Berkman Klein Center for Internet & Society, and it’s worth noting you can find the same materials on the Center’s Digital Literacy Resource Platform (DLRP). I’ve read some of the materials and, while Facebook insists they’re intended for “educators,” I can see conscientious parents using variations on it to keep their little sprogs on the digital straight and narrow. Personally, I think most adults could use a crash course of their own, but something something old dogs, new tricks. I don’t think the idea of educating children about online safety is inherently a bad one. But I noticed, when I try to explore certain modules of the educational materials, I not only found them lacking in what they promised to deliver, but some of the material is literally missing. As I said, the DLRP’s resources are vast compared with Facebook‘s offerings. The DLRP provides modules on Legal Literacy, Computational Thinking, and AI. Some of the lessons include “Is my parody a Fair Use?” and “Understanding Digital Trash.” Also, while Facebook says it’s covering stuff about content creation, I couldn’t find anything about it in their lessons. Sandra Cortesi, the director of the Berkman Klein Center’s Youth and Media Project, told Education Week Facebook‘s lessons are “only a subset of the [100-plus] tools available.” She’s not kidding. Also — and I sincerely hope this is just an oversight to be fixed soon — some of these folders, once downloaded, are empty. At least two folders I downloaded for perusal had no materials in them whatsoever. Also, other materials aren’t included in the modules — for example, in “Introduction to Privacy,” when I tried to download the “What Does Privacy Mean to You?” lesson, I just got the handout for students, not the teacher’s notes, which are kind of important. We’ve contacted Facebook to try and figure out what’s up with that. Facebook‘s Head of Global Safety, Antigone Davis (seriously girl, I appreciate your name), says the point of the activities is to “help these young people build the skills they need to safely enjoy digital technology.” But considering which company is offering the lessons, I’d say getting the kids educated not the only thing Facebook could do to help them. If you really want to protect kids, maybe make sure their information isn’t collected by shady third-party apps like Cambridge Analytica? Or maybe don’t try to indoctrinate them into the thorny world of social media from the age of six via Messenger Kids? The tools, such as they are, are currently available only in English, though there are plans to add up to 40 more languages. If teachers and parents really want to give their kids a serious course on digital literacy and how to be safe online, I recommend they check out the DLRP’s actual site, because they’ll get a lot more material covering much deeper topics.